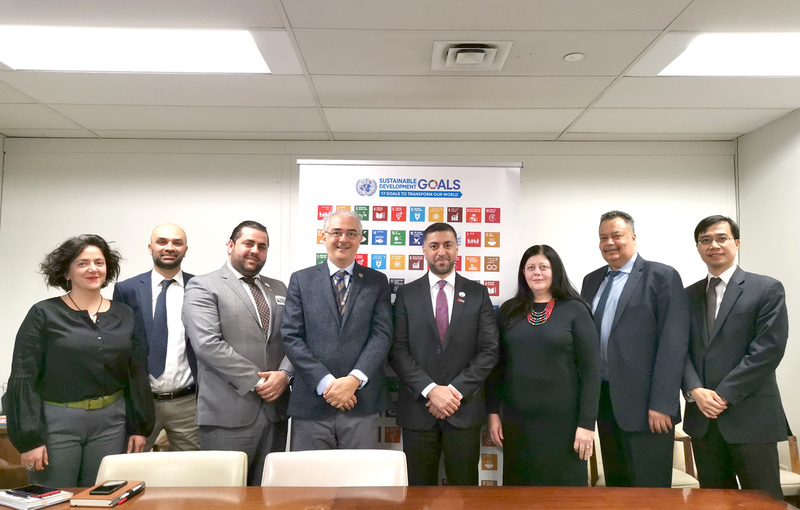 Following the outcomes of the First Arab Digital Economy Conference held in Abu Dhabi last December, the delegation of the Council of Arab Economic Unity (CAEU) visited the headquarters of the United Nations Department of Economic and Social Affairs to discuss the next steps to support Arab governments in their digital transformation. Dr. Ali Al-Khouri, Advisor to the Council at the League of Arab States met Vincenzo Aquaro, Chief Digital Government, Department of Economic and Social Affairs at the UN and highlighted the five dimensions of the joint Arab Strategic vision: Digital foundation, Digital Innovation, Digital Government, Digital Business and Digital Citizen as well as the 50 programs that will lead to the success of the digital transformation in the Arab States and achieve the desired objectives of the strategic vision. The priorities of these programs were reviewed based on the complexity of implementation according to three criteria: ease of implementation, availability of funding, sustainability risk and impact according to four criteria: economic growth, social impact, job creation and quality of life. The impact of the digital transformation on the Arab world economy is significant. By 2030, The Arab Countries GDP Can grow due to Digital economy from 2.6 Trillion USD Up to 4.15 Trillion USD. Total digital growth effect at full maturity could reach up to 333 Billion per year creating around 60 million new jobs in the coming two decades. Aquaro expressed his appreciation for the realization of the join strategic vision outputs and the level of cooperation of international organizations to ensure its success and support its programs’ implementation. Aquaro noted that the support of the Department of Economic and Social Affairs at the United Nations for the joint Arab strategic vision is due to its promotion of the global sustainable development goals, integration of the development plans in the Arab world, directing investments to achieve its positive societal and economic impact and most importantly, the opportunity to create 60 million jobs over the next two decades for the Arab youth. Aquaro stressed that this strategic vision could not have been possible without the support of the UAE leadership and the patronage of His Highness Sheikh Mohammed bin Zayed Al Nahyan, Crown Prince of Abu Dhabi for the first Arab Digital Economy Conference held in Abu Dhabi last December, which was the launching pad for the joint Arab strategic vision programs. Dr. Al-Khouri praised the efforts of the Public Institutions and the Digital Government and their participation in the preparation and review of the strategic vision and continued cooperation to achieve common aspirations for Arab societies.